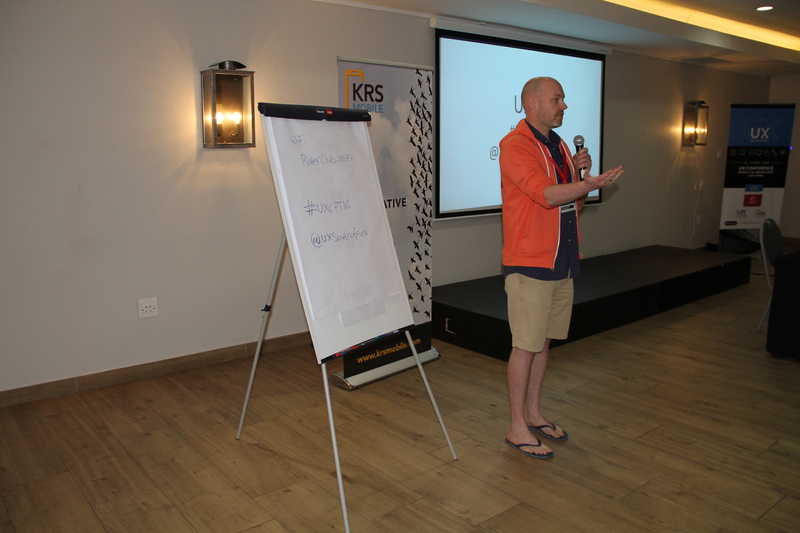 Last week I attended UX South Africa with a slightly different hat on: I was MC for the event. Here are some of the things I did to try and help attendees get the most from the conference. Igy, one of the organisers, asked me to MC. After thinking about it for a bit, wondering if I could do a good job of it, and googling what an MC’s responsibilities are, I said yes and got to work. I made a big list and looked at how I might be able to wobble some of these tasks to make them a bit more interactive and Training From The Back Of the Room-y. I realised that I was treating it like facilitating a workshop. I decided to roll with it and started planning what I could ask attendees or what I could get them to do. What’s one thing you’ll change at work tomorrow? What was one thing you learned from that talk? What was the most interesting thing about that talk? I also asked one of the questions after the lunch break on both days. 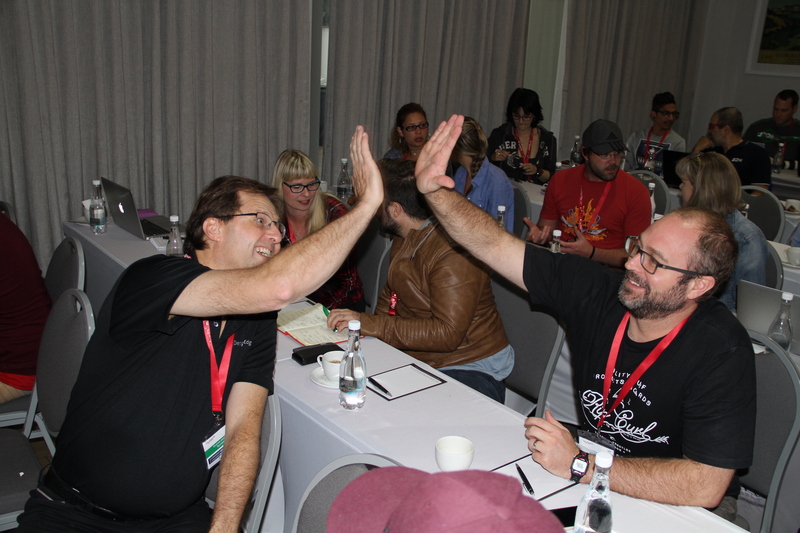 It’s easy to be a bit sleepy and lethargic after lunch, so I wanted to try and help everyone wake up a bit and get energised for the next talk. The room was buzzing with conversation, so I think it helped a bit. 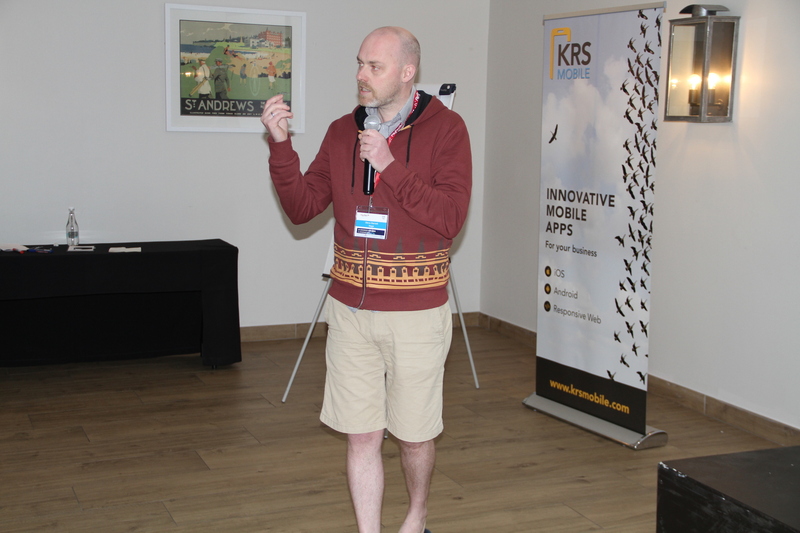 For calling the room to order, I used (what I think is) a Nonviolent Communication thing: raised a hand and waited for everyone else in the room to do it and go quiet. 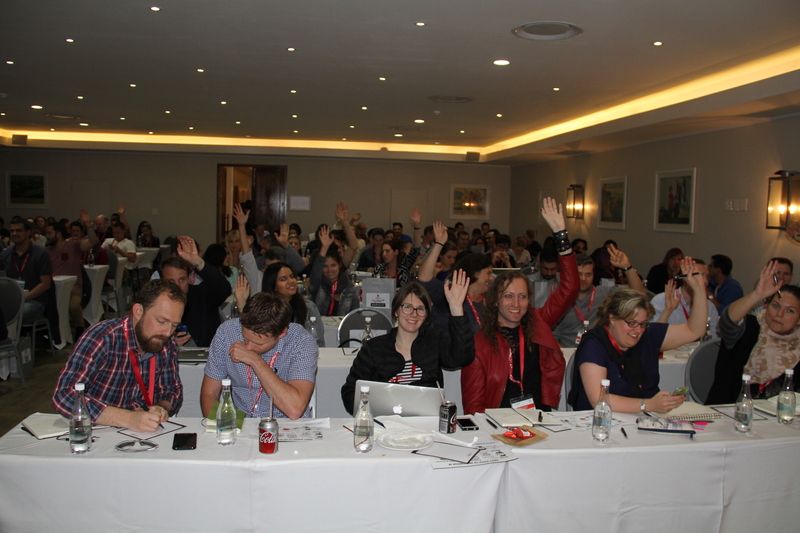 I was a bit sneaky in that I explained it to the room first, then got the front row to help me start the wave of arms each time we needed to settle down. Another one of the things that I tried to help with was time-keeping. I think we ended up running quite a tight ship: nothing ran over by more than a few minutes. I had A4 signs with time countdowns for speakers that I waved at them from the end of the front row, which I think helped a bit. I helped usher people back in at the end of the tea and lunch breaks. I also tried to help with questions in two ways. First, I made lots of notes during the speakers talks (although I was sad not to be able to Sketchnote: that would have required a more focused approach and I needed to keep an eye on technical and admin side of a things a bit) and had questions ready for them for after the talk and for the panel at the end of the day. Second, I asked speakers to use the repeat-for-the-audience technique. 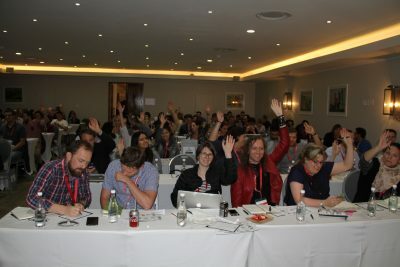 Rather than running around with a mic and having everyone wait, hands went up, and an attendee would call out their question. The speaker would then repeat the questions so that the whole audience could hear, and to clarify the question where necessary. I enjoyed it a lot, and I hope that I added some extra value for the attendees. From small pieces of feedback I’ve received, I think that I did. It was exhausting, though. When I’ve been at a conference giving a talk or a workshop, I’m nervous until I’ve done my thing. After that, I relax. MC-ing meant I was always on: I was “about to get up and do stuff” all day. Although I found it very energising during the day, I was worn out by the end of the 2nd day of the conference. I didn’t do much at all in the way of speaker introductions. I assumed that speakers would introduce themselves near the start of their talk, but only some did. If I MC again, I’ll do a short introduction for each speaker, giving a bit of context for them and their talk. I’d also use the projector for instructions for the mini-activities. This time I used a flipchart or just spoke the instructions. The flipchart text was too small for people at the back to see, even in big letters. I didn’t want to use the projector to leave it free for the next speaker. Next time I’d have the instructions up on screen, leave them up for a minute, then unplug and get the speaker set up. I’d also like to have done a better job of transitions and linking the talks. I did use themes for blocks of talks as prompts for mini-activities, but I could have highlighted a thread throughout the day more clearly.